So presumably if you are reading this blog post, you were not one of the Chosen to be raptured away before the time of tribulations begins. (This is unless the ethereal plane has WiFi.) Yes, the prediction made by Harold Camping, 89-year-old civil engineer-turned-radio evangelist, has gone the way of so many other apocalyptic predictions. Yet, like many other prophets of the End of Days, Camping has revised his predictions in light of the fact that we are all still here. As Camping now tells it, May 21st was an “invisible Judgement Day” (I guess you needed special 3-D Revelations glasses to see it) and that all the horrific events of the Apocalypse will now happen on Oct0ber 21st. If you find this to be a confusing bit of illogical gymnastics, consider Camping’s method for arriving at the May 21st date. In his piece for Salon.com, David S. Renyolds summarizes succinctly Camping’s numerological calculations (he’s an engineer after all). From what I can glean, part of Camping’s “Bible-based math” involves multiplying a set of arbitrary numbers to arrive at 722,500, supposedly the number of days between the Crucifixion and the Rapture. Incredibly, Cromwell showed a remarkable, for him at least, amount of tolerance towards the FMs. He did include 12 FMs in his “Bare Bones” Parliament. Also, Cromwell partly shared their millenarian beliefs. 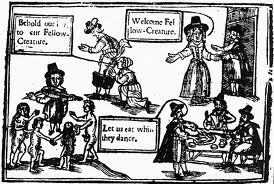 For example, Cromwell initiated actions during the Interregnum to allow Jews to be legally permitted back into England. (They had been expelled formally in 1290 under Edward I.) Cromwell, however, did so due to the belief that the conversion of the Jews would be one of the events that would lead to the end of days. In this way, Cromwell anticipated the support for the country of Israel by some modern day Christian sects who likewise see the conversion of the Jews as part of the Apocalypse. This entry was posted in Why the Renaissance matters and tagged Andrew Marvell, Apocalypse, Fifth Monarchists, Oliver Cromwell, Puritans, Quakers, Ranters. Bookmark the permalink. My blog is about Healthy recipes for weight loss.